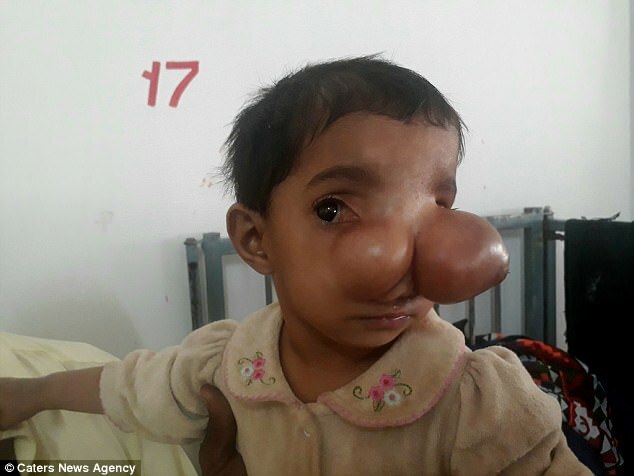 A toddler with a trunk-like 'elephant nose' that was bigger than two tennis balls has finally had it removed in life-saving surgery. 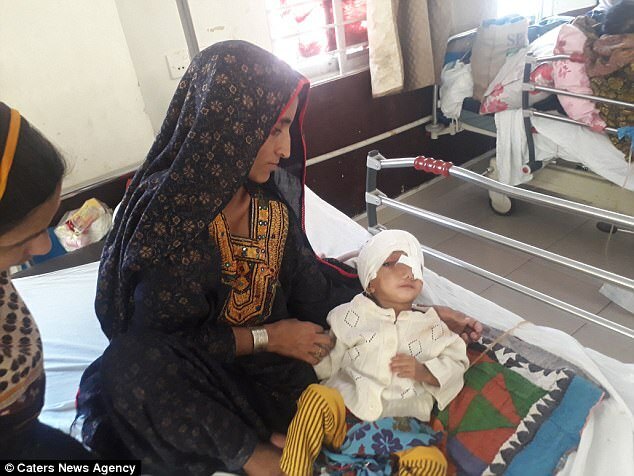 Sixteen-month-old Asiya Manghrio, from Sanghar in Pakistan's Sindh province, suffered from frontonasal encephalocele, which caused her brain tissue to grown through a defect in her skull. Branded a 'curse' by her own grandparents, the condition, which can affect sufferers' breathing, left Asiya unable to eat and in constant agonising pain. 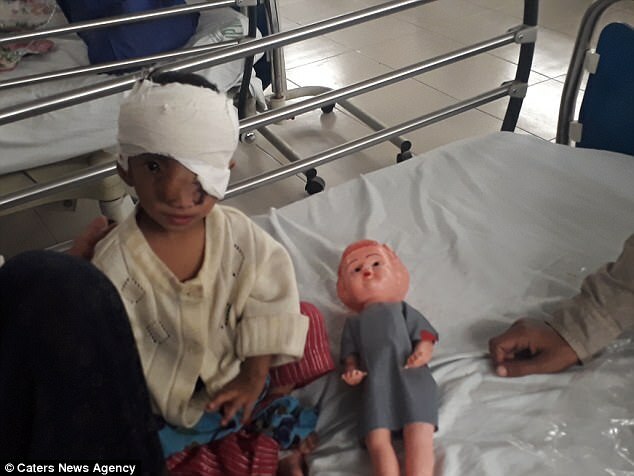 Last week, Asiya had life-saving surgery in a three-hour operation after doctors at Jinnah Post Graduate Medical Centre performed the procedure for the impoverished family for free. The surgery went to plan and the youngster is due to go home next week. Neurosurgeon Dr Lal Rehman said: 'It was a complicated surgery but everything went as per the plan. 'The patient is absolutely fine now. She was initially given [a] liquid and semi-liquid diet only but now she can take biscuits as well. 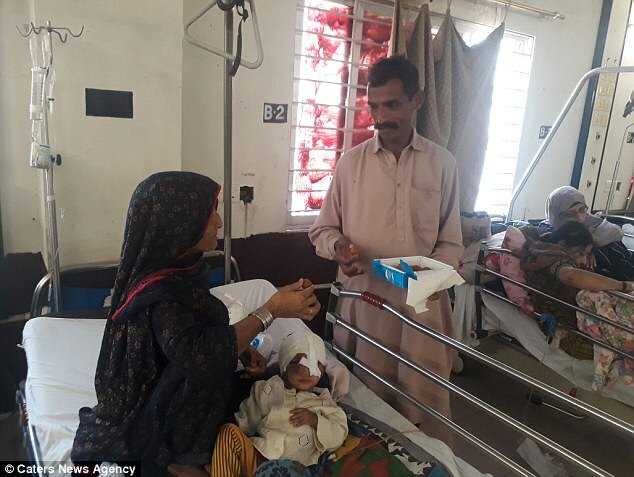 Asiya's father Achar Manghrio, 27, who works as a daily wage farmer and earns only £100 a month, added: 'We were worried about the success of [the] surgery as doctors told us that there is a lot of risk involved in the surgery. 'I was on fast and was constantly praying while sitting outside the operation theatre. 'We are happy that everything went well and are thankful to the doctors and the hospital administration for performing the surgery free. Ms Achar sold her only gold bracelet to pay for the 160-mile journey to the hospital in a local bus, along with her husband, to get Asiya treatment. Encephalocele is a rare neural tube defect present at birth that affects the brain. Encephalocele is defined as a sac-like protrusion of the brain and its surrounding membranes through an opening in the skull. The condition occurs when the neural tube does not close completely during pregnancy. This results in an opening in either the middle of the upper part of the skull, the area between the forehead and nose or the back of the skull. Encephaloceles in the nose and forehead region can go undetected for many years after a sufferer's birth. 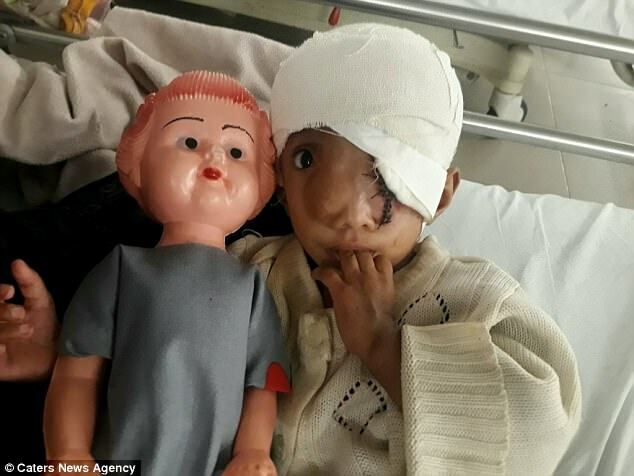 Asiya's extended family have struggled to cope with the youngster's condition. 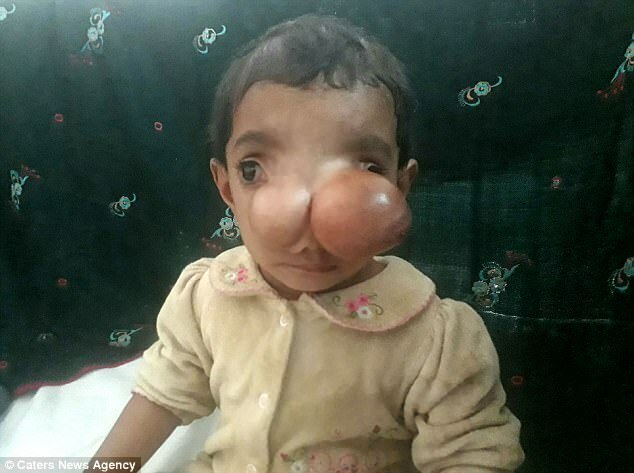 Ms Achar said: 'My in-laws branded me a curse after I gave birth to Asiya as she was born with a swollen nose. Within [a] few months, her nose started growing bigger and bigger. The couple are now waiting for the moment when they will be told they can go home. Ms Achar said: 'I can't express my happiness that my daughter has been treated for her condition which was for torturous not only for her but also for me as well.